Heat 2 teaspoons oil in 10-inch skillet over medium-high heat. Cook chicken breasts, cilantro and cumin in oil 15 to 20 minutes, turning chicken once and stirring cilantro mixture occasionally, until juice of chicken is no longer pink when centers of thickest pieces are cut. Shred chicken into small pieces; mix chicken and cilantro mixture. Brush 1 side of 1 tortilla with some of the 2 tablespoons oil; place oil side down in same skillet. Layer with one-fourth of the chicken mixture, 1/4 cup of the cheese and one-fourth of the chilies to within 1/2 inch of edge of tortilla. Top with another tortilla; brush top of tortilla with oil. Cook over medium-high heat 4 to 6 minutes, turning after 2 minutes, until light golden brown. Repeat with remaining tortillas, chicken mixture, cheese and chilies. Cut quesadillas into wedges. Serve with salsa. To Grill: Heat coals or gas grill for direct heat. Assemble quesadillas on platter, brushing outer sides of tortillas generously with oil. Carefully slide onto grill. Grill uncovered 4 to 6 inches from medium heat 4 to 6 minutes, turning after 2 minutes, until light golden brown. A pancake griddle or large cook-top grill that fits over two burners makes quick work out of cooking many quesadillas at one time. 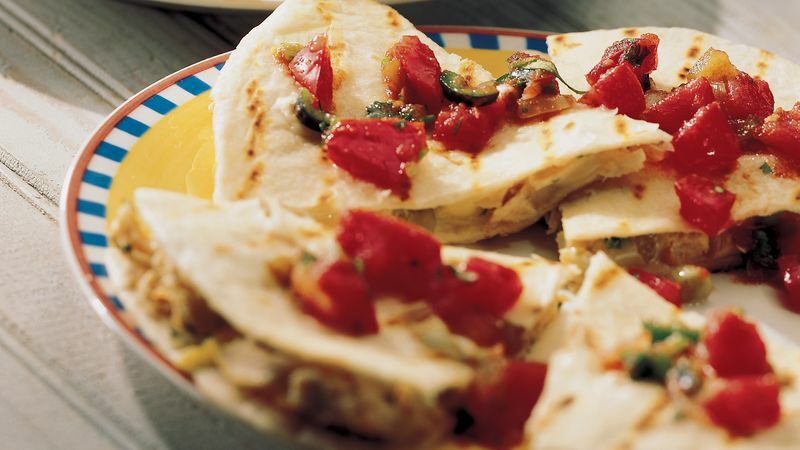 Cut quesadillas into smaller wedges to make appetizer servings.